HUNTSVILLE, Texas — An avowed racist who orchestrated one of the most gruesome hate crimes in U.S. history was executed Wednesday in Texas for the dragging death of a black man. John William King, who was white, received lethal injection for the slaying nearly 21 years ago of James Byrd Jr., who was chained to the back of a truck and dragged for nearly 3 miles (5 kilometres) along a secluded road in the piney woods outside Jasper, Texas. The 49-year-old Byrd was alive for at least 2 miles (3 kilometres) before his body was ripped to pieces in the early morning hours of June 7, 1998. In this undated photo released Feb. 17, 1999 by the Jasper County District Attorney’s office, shows some of the tattoos on John William King. King, 44, was put to death at the state penitentiary in Huntsville, Texas. He was the fourth inmate executed this year in the U.S. and the third in Texas, the nation’s busiest capital punishment state. Within seconds, the lethal dose of the sedative pentobarbital began taking effect. He took a few barely audible breaths and had no other movement. He was pronounced dead at 7:08 p.m. CDT, 12 minutes after the drug began. As witnesses emerged from the prison, about two dozen people standing down the street began to cheer. In this Sept. 21, 2011, file photo, Ricky Jason wears a photograph of James Byrd Jr. outside the Texas Department of Criminal Justice Huntsville Unit before the execution of Lawrence Russell Brewer in Huntsville, Texas. The U.S. Supreme Court rejected King’s last-minute appeal. “From the time of indictment through his trial, Mr. King maintained his absolute innocence, claiming that he had left his co-defendants and Mr. Byrd sometime prior to his death and was not present at the scene of his murder. Mr. King repeatedly expressed to defence counsel that he wanted to present his innocence claim at trial,” A. Richard Ellis, one of King’s attorneys, wrote in his petition to the Supreme Court. In this Wednesday, April 10, 2019, photo Mylinda Byrd Washington, 66, left, and Louvon Byrd Harris, 61, hold up photographs of their brother James Byrd Jr. in Houston. King and Brewer got “an easy way out” compared to “all the suffering” that Byrd faced, Harris said. Mylinda Byrd Washington, another of Byrd’s sisters, said earlier this month that the family will work through the Byrd Foundation for Racial Healing to ensure her brother’s death continues to combat hate everywhere. The body, believed to be that of Andrew “AJ” Freund, was covered in plastic and buried in a shallow grave in a rural area of Woodstock in McHenry County, Crystal Lake police Chief James Black said. Black said investigators went to the site after they interviewed the boy’s parents overnight and presented them with cellphone evidence. Woodstock is about 50 miles (80 kilometres) northwest of Chicago and a few miles from the family’s home in Crystal Lake. “This is not the outcome that we want to talk about … but it is the unfortunate result,” said Jeffrey Sallet, who runs the FBI in northern Illinois. The parents, Andrew Freund Sr. and JoAnn Cunningham, each face charges of first-degree murder and other crimes. An email seeking comment was sent to Cunningham’s lawyer. It wasn’t immediately known if Freund has a lawyer. The couple reported AJ missing last Thursday, telling officers they had last seen him at bedtime the previous night. Freund told a dispatcher that they’d checked “closets, the basement, the garage, everywhere,” but investigators quickly knocked down the possibility of a kidnapping. Crystal Lake police had visited the house over the years, according to records released by the department. One report described the home as littered with dog feces and urine, including a child’s bedroom where the “smell of feces was overwhelming.” Another report said the house was “cluttered, dirty and in disrepair,” and sometimes without electricity. Investigators from the Crystal Lake police department, the McHenry County Sheriff’s Office and the FBI gather at an area northwest of Dean Street and Route 176 in unincorporated Woodstock, Ill., on Wednesday, April 24, 2019. The Illinois Department of Children and Family Services, known as DCFS, had contact with the family since AJ was born with opiates in his body in 2013. The Northwest Herald said he was in foster care for two years before being returned to his parents. A younger brother was removed from the home last week. Black said the cause of AJ’s death remains under investigation. Police removed several items from the home, including a shovel, mattress, paper bags and a plastic storage tub. “We know you are at peace playing in heaven’s playground and are happy you no longer have to suffer,” the police chief said in a public message intended for the boy. “The department is committed to conducting a comprehensive review of the entirety of our work with Andrew’s family to understand our shortcomings and to be fully transparent with the public on any steps we are taking to address the issues,” Smith said in a written statement. Gov. J.B. Pritzker in March ordered an independent review of DCFS after the deaths of a two-year-old girl in Decatur and a two-year-old boy in Chicago. Child welfare workers had contacts with both families. “As with many other deaths, it seems the system designed to protect Illinois’ children did not work in AJ Freund’s case,” Morrison said in a statement. He also complained in the March 25 call that he felt abandoned and tossed aside — like “a man all alone” — after giving more than 100 hours of interviews and testimony to federal investigators and congressional committees. Arnold said he recorded the 36-minute call without Cohen’s knowledge because Cohen was known to record conversations and that he wanted to remember what they discussed. Arnold provided a copy to The Wall Street Journal, which reported on it and posted audio excerpts on its website on Wednesday. It’s unclear where Arnold was when he made the recording. If he was in California, he could face legal scrutiny because the state requires consent from both parties on the call. If he was in New York, he’s in the clear. That state only requires one party’s consent. Cohen met Arnold in June 2018 in what he described as a “chance, public encounter” in the lobby of a Manhattan hotel where Cohen was staying while his apartment was being repaired. Cohen said that Arnold asked to take a selfie . Arnold, who hosted a Viceland series last year in which he investigated rumoured recordings of Trump, told the Journal he made the recent call to Cohen to follow up on their meeting and to offer him moral support. Arnold’s representatives did not immediately respond to an interview request. Cohen is scheduled to begin a three-year sentence on May 6 at a federal prison about 70 miles (113 kilometres) northwest of New York City. His lawyers recently asked House Democrats to intercede to get a reduced or delayed sentence, but they’ve been reticent to do so. According to the Journal, Cohen told Arnold he pleaded guilty to the charges he now disputes because federal prosecutors were looking at his wife, Laura Shusterman, because her name was on a bank account where he deposited $2.4 million in loan proceeds. Cohen’s concerns about the tax evasion and bank fraud charges appeared to echo some of what his former lawyer, Guy Petrillo, wrote in a sentencing memorandum submitted to the court in December. Petrillo argued that Cohen’s tax evasion was “unsophisticated” and warranted less punishment than elaborate schemes. He argued that the bank fraud charge was the result of sloppiness in completing paperwork. The Manhattan U.S. attorney’s office declined to comment. On July 19, 2018, Katie and Mark met the daughter they hoped to adopt. Franny was standing just beyond the front door of her foster family’s home, dressed in her ballet recital outfit and eager to meet her new parents. They had lunch, chatted and played with Franny a little bit. “We were meeting our child for the first time, and we were trying really hard not to cry because we didn’t want to freak her out,” says Katie. Franny was initially shy, but over the afternoon she started to warm to Katie and Mark (the names of the parents and children in this story have been changed for privacy reasons). As they were leaving, Franny ran up and gave them both hugs and said, “I’ve waited for you guys for a long time.” On Aug. 11, after almost daily visits, Katie and Mark brought Franny home for good. And it was only then that they realized how much work it would take to become a family. READ MORE: How did good parenting become a crime? The oft-used phrase “forever family,” the idea that all previous families were simply temporary arrangements, is a pretty major nod to the instability that’s experienced by adopted kids who have already seen family life go bad, and are understandably wary and prone to mistrust. For many adoptive parents, the arrival of a kid—their kid, who just happens to be a stranger—sparks the beginning of months or years of often hard-won adjustment. Yet those who adopt children in Canada aren’t entitled to the same amount of leave as biological parents. The federal parental benefits system currently offers 50 weeks of paid leave to biological parents, and just 35 weeks for adoptive parents. The process of a family incrementally bonding is often made more complicated by the pragmatic challenge of taking time off. Mark burned through all of his vacation days during the preliminary transition period before Franny came to live with them, so his ability to spend time with her has been limited. 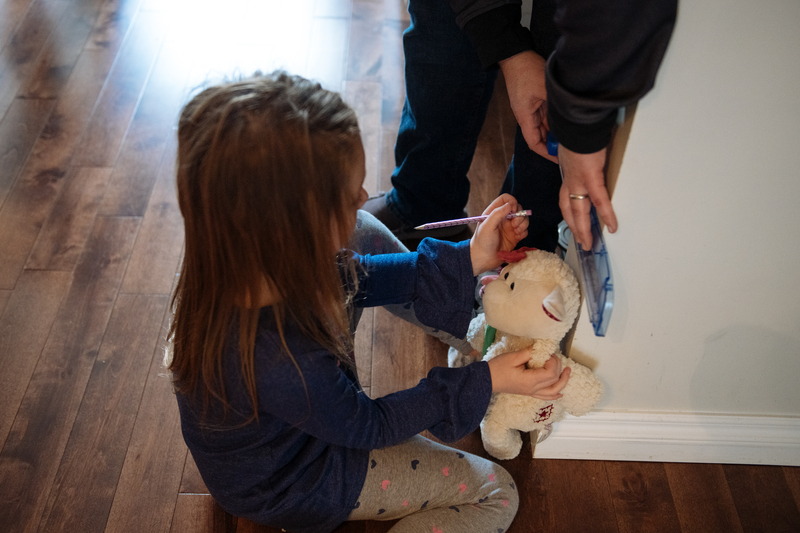 Katie has been home with Franny since August, but she runs out of Employment Insurance in April and will have to take unpaid leave for the balance of their first full year as a family. In addition to spending hours a day at Franny’s school, Katie also has to juggle visits with lawyers, social workers, health care professionals and visits from an attachment therapist. “Even though Franny says she feels stable, we can see that she’s not there yet,” says Katie. Franny first came into care when she was three, but she has clear memories of her parents and eight siblings. Her birth home was full of drug and alcohol abuse, along with severe neglect. Shortly after Franny turned four, she was returned to her parents, who promptly lost their home. For a stretch, the family lived in tents in someone’s backyard. Franny describes the tents as “yucky,” noting that it was almost always damp, and soaking wet when it rained. She had to use the bathroom inside the house, but the house was filthy and the toilet often overflowed. At one point, Franny was so riddled with lice that the back of her head was an open sore. Franny’s trauma has manifested in the form of nightmares and anxiety, along with a fierce independent streak and a reluctance to let Katie and Mark take care of her. Now seven, she’s obsessive with cleanliness, washing her hands constantly and using craft supplies to build “lice traps.” Franny’s baby teeth are rotten, and she’s behind in both reading and writing. After she was removed from her birth parents’ care, she spent three years in three different foster homes, where she was typically separated from her siblings. “It makes it harder for her to attach to us because she’s been moved around so many times,” says Katie. Her family’s experience reflects the issues faced by many in the same position. There are currently 70,000 children and youth living in the system in Canada, and 30,000 of those children—most of whom are over the age of six—are waiting for family placements. Each of these children has a family history—often a challenging one—that affects the process of integrating them with their new family. But that reality isn’t recognized by the 35 weeks of leave, adoption advocates say. In June 2018, the Time to Attach team at Western University conducted a large-scale national survey on parental leave and attachment. The survey found that 72 per cent of adoptive parents agreed that the current leave structure did not permit enough time to bond with their adoptive children, that approximately half of adoptive children have complex or special needs that complicated the transition, and that 20 per cent of newly adopted children have a different language of origin than their adoptive family. Feeling “safe” and cultivating the ability to form healthy attachments is part of a development process that takes place in the crucial first few years of life. Infants are primed for dependence, and the reaction of their caregivers provides them with a narrative that can shape the rest of their life. If a parent is responsive and provides comfort, a child can learn that the world is a safe place. But when a child experiences violence or neglect, when they’re punished for crying or permitted to go hungry, the lesson is also clear: You can’t trust those closest to you. READ MORE: When it comes to parenting, can men really have it all? A difference in family histories can also lead to a divide between adopted children and their parents. As Land points out, most adoptive parents have not had a history in the child welfare system, nor have they been adopted from orphanages in the developing world. 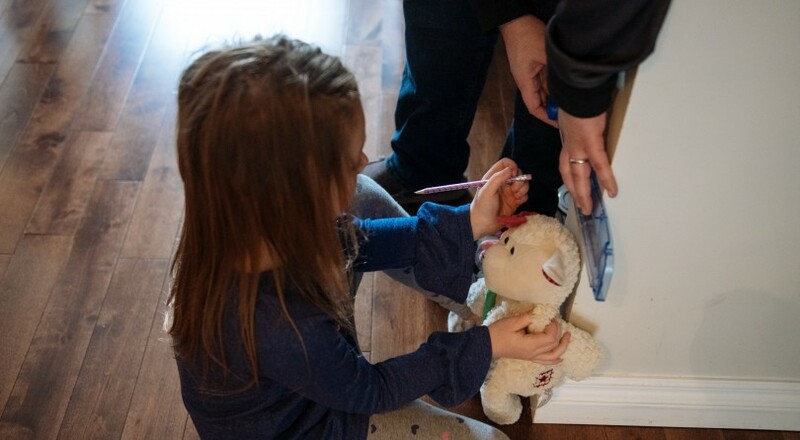 When Colleen and her husband first picked up a picture of four siblings—ages three, five, seven and nine—at an Adoption Resource Exchange, a conference where prospective parents can view the profiles of children awaiting homes, in southern Ontario in 2011, they knew they had to bring them home. Colleen already had two biological children, but suddenly they were a family of eight. The four siblings had recently experienced an adoption breakdown, having been returned to care after a year and a half with a previous “forever family.” In addition to that particularly acute trauma, Colleen soon learned that all of the children had previously undiagnosed fetal alcohol spectrum disorder. Within two days of their move-in date, the house was engulfed in chaos. “When I say it was 24 hours a day, people think I’m exaggerating, but other adoptive parents know,” says Colleen. The children were also prone to highly destructive fits of rage and frustration that could be triggered by the smallest things, like not getting a preferred cup at dinner. They punched holes through drywall, smashed furniture and ripped handles off doors. They frequently attempted to run away, one bolting through the front door toward the highway, another through the back door toward a field. The youngest, in particular, often sobbed through much of the night. The eldest, skeptical that this arrangement could possibly be permanent, had Colleen note the 18-month mark on a calendar—the point at which their previous adoption had broken down. “He decided that if we get to that date together, then he’ll trust us,” she says. In addition to shortened parental leave, some adoptive parents also receive less social support than their biological counterparts. This, too, can complicate the process of settling in. Adoption is seen as a noble act, but almost certainly less celebratory. The months leading up to the awarding of legal custody aren’t full of approving nods from strangers giving up their seats on buses to pregnant mothers. Baby showers, gender reveal parties and balloon bouquets are less common. While at times they’re overwhelmed, Katie and her husband haven’t had to deal with any diagnosed physical or mental disabilities, or any major trauma-related behavioural issues—and that makes Franny an anomaly in the broader adoption landscape. The family plans on using up their nest egg, pooling all their available resources to help ensure that Franny can be a happy, healthy and well-loved little girl. What happens if my toddler finds my pot and eats it? How to raise outdoor-loving, independent kids? Ask the Germans.